Marine Deano Miller and Thor, his bomb-sniffing dog, first met during a 2010 tour of duty in Afghanistan. Miller eventually returned to civilian life in Tacoma, Wash., but Thor went on to serve a few more years. And when word got out that the yellow Labrador was coming back to the U.S., Miller knew he had to adopt him. “He was the only thing that kept me going every day,” Miller said. 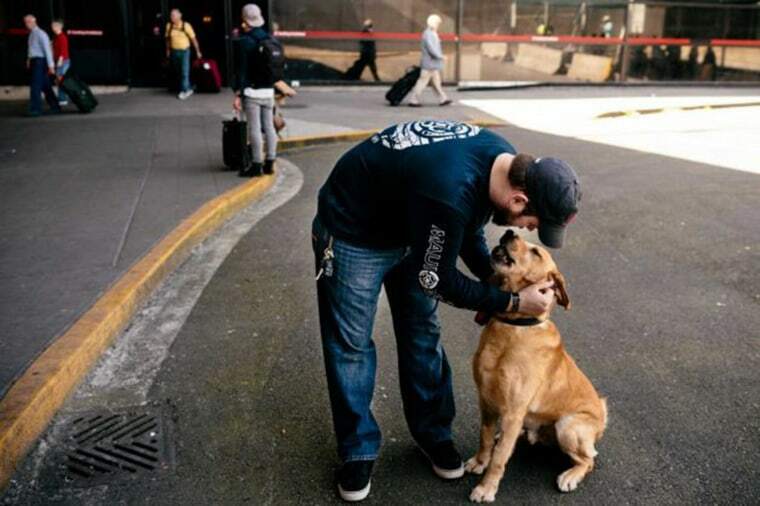 The two reconnected at the Seattle-Tacoma International Airport on Thursday and it’s one of the sweetest reunions we’ve seen. A dragon is growing in England – and we’re not talking about the latest installment of “Game of Thrones.” Norfolk native John Brooker has spent more than a decade sculpting his hedge into a massive dragon, complete with snarling teeth and pointed horns. Brooker, a 75-year-old retired fan maker, told BBC News: “I was standing at my kitchen sink one day and thought the hedge was boring, so I decided to do something with it.” At 150 feet long and 10 feet tall, the dragon hedge is going to need some pruning. Embattled Clippers owner Donald Sterling has agreed to turn over control of the team to his wife, Shelly, in order to negotiate a forced sale of the franchise. The NBA began taking action to force the Sterlings to sell the franchise after tapes leaked of Donald Sterling making racist remarks. Since then, a series of interviews and other recordings by Sterling have only added more fuel to the scandal. Sterling bought the Clippers in 1981 for $12.5 million. Today, they are valued upwards of $1 billion. The United States has its team for the World Cup, and Landon Donovan isn’t part of it. At 32-years-old, Donovan has been the face of U.S. soccer for the past 12 years, but U.S. coach Jurgen Klingsmann has cut him from the roster. The move wasn’t a surprise to those who have followed the national team closely. “I just see some other players slightly ahead of him,” Klingsmann said in a statement. Donovan is widely considered the best player in the history of U.S. men’s soccer, and he’s the career leader for the national team with 57 goals. 5. Can You Find Yourself in NASA’s Global Selfie? On Earth Day, NASA asked people from around to world to take a selfie and upload it on social media with the hashtag #GlobalSelfie. Now they’ve released their final “global selfie” mosaic, after receiving submissions from all over the globe. Explore an interactive map of all 36,422 pictures on NASA’s website. Doppelgängers Will Ferrell and Red Hot Chili Peppers drummer Chad Smith faced each Thursday night for their much-anticipated drum-off on “The Tonight Show.” The feud between the two began in February during a Reddit AMA, when Ferrell joked: “A lot of people think that it’s me playing for the Red Hot Chili Peppers. But that would be an insult to Chad Smith. The truth of the matter is there is no Will Ferrell. Only Chad Smith.” The drum battle was everything you could ask for – mockery, great drumming, identical outfits – plus, it raised money for charity. We won’t spoil the ending, but there was a golden cowbell and a surprise musical guest.